Check out my new Pet Grooming Glove! 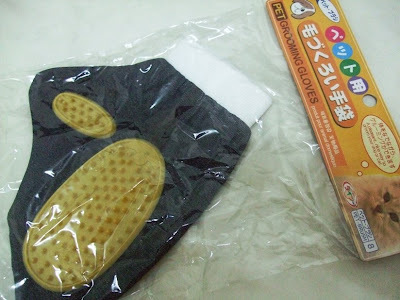 MIL got this for my cats on her last trip to Daiso (one price Japanese living ware store). I love this new pet grooming glove; it makes brushing my cats so much easier. All I gotta do is slip on the glove, hold Benji down firmly with one hand and use the gloved hand to pat, brush and stroke him all at the same time. And even if Benji wants to playfully bite my gloved hand, I won't feel the prick thanks to my cool new pet grooming glove! By the way, I also want to say a big thank you to everyone who dropped by with well-wishes for Benji. He is doing fine now and there's no more throwing up. 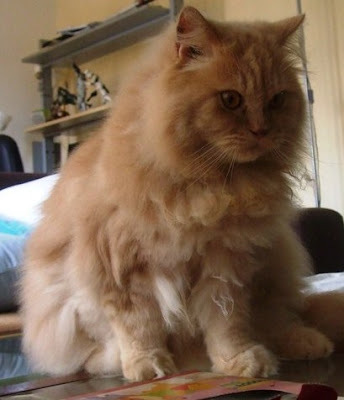 His appetite is good and he is as playful and fluffy as ever. Let's hope for no more cat sickness this year okay? hahaha.. my mom has this glove as well for her Baby GP.. it is a useful tool indeed!! So glad he is doing better.. no more sick kitties this year.. hear hear!! i'm still writing my transformers post!! LOL! so slow nak upload pics! LOL! Oh me too, mmg lega kan when our kids are safe and sound and fluffy-fluff! Sayang Benji meow! Still writing ur post Shemah? Lama tu LOL! Where yeah? MSE ke? Nak chop! hey Shemah.. i'm trying to be active again at Today.. or least sampai payout lah.. im stuck at 30+ there .. lol.. but eh.. the uploading of pics now faster lah..
Yay Mon! 1 point finally here at meow! That’s why, finally u got to chop, must do more posts here before end month! Ha ha ye ke?? LOL!!! Pheebs is easy to recognize, she’s the smallest and CHubbs is grey colour while Benji is beige/cream! Meow! hahaha all 1 point! oh u've casino PB right? I got 1 casino PB but still got 4 more days to do it lol! wow ok do another post la Mariuca!!! I support u........hahhahahahhahhah! He he wait n see Mon! LOL! Recent blog post: Mak Datuk! Tag Yang Sememang Nyer Giler Betul! aw, Benji looks extremely gorgeous. he's so loveable, isn't he?. i'm glad he's back on track. I´m happy to know your Benji is doing well now. Maybe it was just a bacteria or something he ate. Sometimes fur balls in their stomach can be a problem as well. TUO not no.10 lah Mariuca....hahahahaha! Ohhhh hahahhahahahhahahahh number 12!!!!! Aiyooooooo nemind, still on the list LOL!!!! I tot my widget was for top 10, see2 top 12 lol! Thanks for all ur drops sweetie and hey, at least ur number 1 TCM here! my widget is for top 12....coz i don like got 2 empty spaces there..LOL! ROTFLMAO!!! Same la!!!! I oso don like to see 2 empty spaces there, whats up right? Hahahahhaha! Choose the mini globe Mon! I stuffed mine right down below at my storage space at woafs haha! Got mini globe la Mon! ok i'll check out the mini globe Mariuca....see how mini....lol! LOL! Very the mini, Mon! there...hahhahaha!! 2 empty spaces oso cannot... remember? LOL! yeah the one at LJL is very big.....hehe! Very the mini until cannot see traffic oso no point right? hahhahaha! The one at LJL is the biggest size Mon lol! ohh biggest size! my sidebar is very small so cannot put the biggest size! The bigger the better.. lol! Hehehehhe. the bigger the better I say.. lol! That's why. the bigger the better mon.. lol! Hehehhehehhehhehe LJ in a bergurau senda mood ke tu? ROTFLMAO!!! hahhahhahha LJ!! so many times "The bigger the better" lol!!! LOL! Yeah la LJ, so many times emphasizing bigger is better hahahaha! lol.....of coz the bigger the better LJ!! depends on what oso...hahahaha! LOL!!!! I’m sure LJ doesn think the bigger the better for B***S cause she said she wants smaller ones hah ha ha! haha LJ wants smaller ones eh... for B***S I want bigger!! hahahhahha! U and Ane want bigger, I don mind smaller hehehhehehhehehehhehehehe! But nemind la, happy edi with what I got, now just have to be SW like u and Ane! I don mind SW and that one smaller a bit hahahahahahahhahhaha!!!! hahahahhahhahaha..........i want SW and that one bigger a bit! LOL!!!! Hahahahhahahahahhaha asking for too much la we all, SW but smaller, SW but bigger ROTFLMAO! Hahahhahahahahah don make me laugh while I’m cooking la Monica! Hahahahhaha! why u laugh while u're cooking Mariuca?? hahhahahhahahhah! The bigger the better. lol!! Hehehhe.. yelah the bigger the better .. for certain things only lah!! That one I want smaller a bit only mah. lol!! I also want SW.. whatever that is? What is Sw?? Hahahah GP.. laughing and cooking.. eh don't forget to add salt.lol! Hahahha.. YES MAAM!! Bercanda mood..lol!! Hahahahah.. aiyah.. very big mah?? Ok only I see..lol!! Hahahhahah I don think u wan SW LJ, SW= Skinny Winny! I wan SW!!!! Hahahahhahaah LJ u baca pasal ur globe ke? Hahhahahahahha gelinya hati! Hmm.. yelah don't want lah.. I want my curves.. lol!! balance off the sides.. so I choose the big one.. lol!! Yes.. got mini globe Mon.. So far so good, love my globe! Am eating wasabi kacang hijau now!